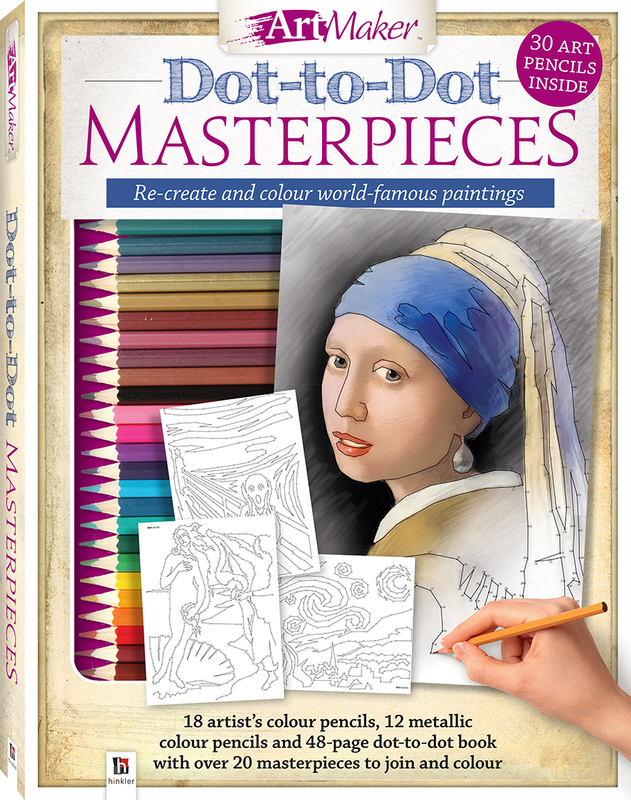 Escape to a world of inspiration and artistic fulfilment as you re-create some of the world’s most iconic works of art with Dot-to-Dot Masterpieces! It takes time, patience and sharp eyes to complete these uniquely entertaining puzzles, which are printed one-sided on easy-to-tear-out pages for simple removal and display. When you’re done, double the fun by colouring in the finished images! Each page features hundreds of numbered dots that gradually reveal famous works of art by many of the world’s greatest artists, from Johannes Vermeer, Vincent van Gogh, Gauguin and Rembrandt to Michelangelo, Paul Cézanne, Degas, Claude Monet, Leonardo da Vinci and many others. This kit contains everything you need to bring these masterpieces to life, with 18 artist’s colour pencils and 12 metallic colour pencils, plus a 48-page book containing over 20 tear-out puzzles and their solutions.